As you know, politics have become a major influence on the global economy and financial markets over the past few years (Brexit, the election of Donald Trump, the new Italian government). The upcoming midterm elections for the US Congress on 6 November are yet another example of the geopolitical risks that we as investors must manage. We are not political experts, but we do have a well-developed understanding of economic and market drivers. After considering the state of the race, as well as the likely outcomes and their effects on policy, our base case is for a split Congress that will lead to a modest sell-off of US equities, falling bond yields, and put the dollar under pressure. However, because the economic fundamentals will not change meaningfully, we would view such market activity as an opportunity as it will likely reverse when uncertainty subsides and fundamentals return to the fore. The Founding Fathers of the United States constructed Congress as two chambers with broadly different purposes and hence their different election contexts. They conceived the House of Representatives (the “House”) as the popular voice, so they designed it to be most accountable to the people with elections held every two years for all seats. Each state has a number of House seats in line with the size of its population and the seats are determined by district-level voting results. At present, there are 435 seats in the House, with 218 seats required for a controlling majority. On the other hand, the Founders intended the Senate to be a deliberative body that would not be so easily influenced by the popular will (or “tyranny of the majority”) and instead would balance the interests of small, less populous states against the larger states. Each state, therefore, has two Senate seats and the Vice President of the United States holds the deciding vote in the case of a tie. Of these 100 seats, a third are elected every six years. Currently, the Republican Party controls both chambers, with 235 Representatives and 51 Senators. One of our preferred barometers for understanding the state of the election is the model developed by Nate Silver and his team at FiveThirtyEight (www.fivethirtyeight.com). They aggregate and adjust a wide swathe of polling data, overlay a fundamentals model that accounts for fundraising, incumbency advantage and other factors, and then include ratings from non-partisan experts. Charts 1 and 2 show FiveThirtyEight’s probability that each party will control the House or Senate, respectively, from which we can see a clear divergence: the likelihood that the Democrats will control the House is high (82%) and rising steadily, while their chances to control the Senate are low (15% currently) and falling. Indeed, the FiveThirtyEight model assigns an 80% chance that the Democrats will win between 213 and 249 House seats, with a median outcome of 229 seats. However, in the Senate, it assigns an 80% chance that the Republicans will control between 49 and 55 seats, with a median outcome of 52 seats. However, bear in mind that a variety of routine factors could swing the vote one way or the other, be it turnout during midterm elections (which is typically lower) or standard polling errors (as Silver wrote on the morning of the 2016 election, Donald Trump was within a standard polling error of winning the presidency while Hillary Clinton was the odds-on favourite). It is also important to consider the other probabilities implied by these chances. 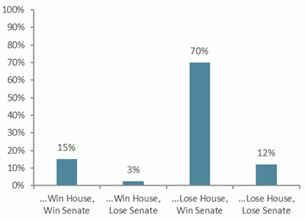 As Chart 3 shows, while the most likely outcome is for the Republicans to lose control of the House but maintain control of the Senate, they are about as likely to control both chambers as to lose them to the Democrats. There is also nearly a 35% chance one of these predictions is wrong, so we cannot say the outcome is a foregone conclusion. 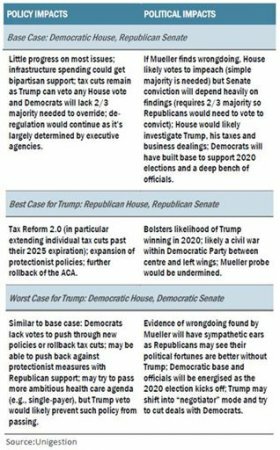 Despite this uncertainty, our base case remains that the Democratic Party will win a majority of seats in the House, while the Republican Party will maintain its majority in the Senate. The first midterm election after a new president takes office is often viewed as a referendum on the new White House administration. Barack Obama faced this reality in 2010 after passing the Affordable Care Act (ACA). During the midterm elections that year, the Republicans gained control of the House by winning more than 50 seats, while also reducing the Democratic majority in the Senate. This year’s election is unlikely to be different, as each side is viewing it as an opportunity to either resist or support Trump and his policies. As Table 1 illustrates, the likely policy impacts in each of the key scenarios are minor, however, and do not present significant downside risk to US growth: tax cuts will not be rolled back for at least the next two years, as the Democrats will not have the votes to overturn a presidential veto. In the worst-case scenario, the individual tax cuts will not be extended beyond 2025, which would depress growth at that time but have little impact for many years. The political impacts of this would be much more significant, however, especially when combined with the potential announcement by Special Counsel Robert Mueller of his findings after the election. Moreover, the election results will energise whichever party is perceived to be the winner and push them forward for the 2020 elections. Given the large number of women who are congressional candidates this year (257 versus the previous record of 185, according to the Rutgers University Center for American Women and Politics), it is also likely the composition of Congress will shift meaningfully, which will have important implications for other domestic and foreign policy issues. Despite the relatively minor impact on the real economy, we expect the impact on markets may be significant in any of the scenarios described above. 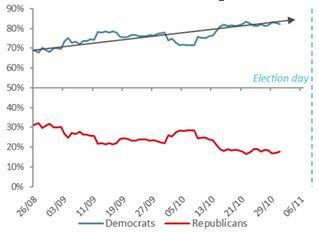 For example, PredictIt, an online market for elections results, has the Republicans at about a one-in-three chance of retaining control of the House (as of 31 October), suggesting a Democratic win would be a modest surprise. If the Democrats win the House, they would have the will and ability to add uncertainty to fiscal plans, foreign policy, and the future of the Trump administration itself. The House has the power of the purse: by law, all bills aimed at raising revenues must originate in the House, which traditionally has also been the originator of all spending bills. The House also has powerful standing committees, chaired by a member of the majority party, on a range of issues including ethics, homeland security, foreign affairs, and government oversight. These committees also oversee executive agencies and have the power to hold hearings and subpoena witnesses and evidence. Under Democratic control and with an electoral mandate, it is highly likely that these committees would be much more confrontational in their dealings with the Trump administration and policies. If the Democrats were to gain a majority in the Senate, their ability to direct policy would only change marginally as such a majority would likely be very narrow (only one or two seats). Nevertheless, a Democrat-controlled Senate would reinforce uncertainty, especially if Mueller finds evidence of collusion or obstruction of justice. In either of these scenarios, we would expect US equities to sell off, bond yields to fall, and the US dollar to come under downward pressure. However, as we do not believe the fundamentals would significantly change for the US, we would use this as a buying opportunity for US equities and potentially gaining upside convexity via equity options. This is not without risk, as uncertainty could weigh on investors for some time, making it tougher for the fundamentals to reassert themselves. Taking a long volatility position to benefit from this uncertainty may sound attractive, but pricing will be key: the negative carry costs work against you and a pickup in realised volatility may not flow through to implied volatilities. On the other hand, if the Republicans retain majorities in both chambers, US equities will likely rally and yields rise as uncertainty falls and the market adjusts its expectation for additional tax cuts and continued de-regulation. An “America First” policy will also take centre stage again, pointing to US equity outperformance relative to other economies and a stronger US dollar on the back of this and higher yields. However, it will be critical to position for this ahead of the election when pricing is still attractive.